For some years, people are becoming increasingly aware of the importance of caring for their body, and therefore, their health. The trend in the last 10 years has been impressive, today it is impossible for us not to see people of all ages running around the park or exercising. In these times, the image seems more than fundamental, there are more and more care and solutions at our disposal about any type of service that we may need. Logically, no possible remedy is miraculous; any change requires its time and process to achieve the results. You are always in time to have a good body; it is never too late for it. That is why you will find in this post multiple exercises and solutions that will get you the results you are looking for. There is no way to avoid the fact that in order to lose weight safely and permanently, you need to eat healthy foods and get plenty of exercises. 1 How to lose weight faster? The American College of Sports Medicine reports that it can accelerate your metabolism up to 24 hours after exercise by making a small but significant change in the exercise routine: intervals. In other words, to optimize your performance, you should insert moderate exercise (such as continuous jogging) with intensity increments (for example, every 5 minutes of jogging, 30 seconds of sprint or almost sprint). Similarly, depending on your physical state or your goals, you can run by walking. It would be carried out also intercalating periods of a quiet walk with a noticeably higher march. The longer we do these exercises, and the more we do, the more calories we can spend. As a consequence of these increases in intensity, it takes several hours for the metabolism to slow down again. This means continuing to burn calories even after the shower and snack. It is a classic, but not less effective, but rather the opposite. Walking is the most effective weight loss exercise for performance reasons, and secondly, its low cost since we only need a pair of comfortable sneakers. This is not a high-intensity exercise; therefore, it is not common for injuries to occur. High-intensity exercises wear out sensitive areas such as the knees, which are usually one of the headaches for more widespread athletes. For those with health problems like obesity, or heart-related diseases, walking is an effective low-intensity activity. Depending on how much you weigh, walking will burn between 5 and 8 calories per minute, or between 225 and 360 calories in 45 minute runs. 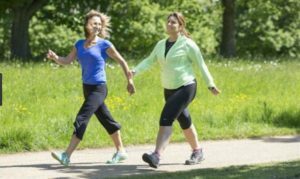 At this rate, walking 45 minutes a day frequently, you can end up losing more than a kilo and a half a week without having to over-modify other habits. Of course, if we want to see results as soon as possible, adapting our diet to the goals set is the most reasonable. If you like to run, you will not have problems when it comes to losing weight. After an hour of running at a good pace, they usually lose around 600 calories per hour. In addition, it helps to strengthen bones and maintain a good blood pressure to help prevent heart disease, strokes and certain types of cancer. As I said earlier, training by doing intervals of intensity will further improve the results. For those who are not too fond of sports, they can turn on the radio, or take the opportunity to listen to music to make it more bearable. In case you have work close, you can take advantage to walk. You’ll save on transportation and you’ll save time by not having to do it in the afternoon. Any circumstance is good to seize the moment and walk. When it’s raining a lot, or you have no plans, if you have a tape do not hesitate, get going. Swimming is possibly the complete sport of all, and therefore, one of the most calories burn (between 400 and 700 per hour). Not all types of swimming are effective for losing weight. All those who required considerable effort would be worth it. swimming is a most effective weight loss exercise of women in the last trimester of pregnancy, people with obesity, those with arthritis, and musculoskeletal diseases. It is also advisable for those who suffer from exercise-induced asthma because hot, moist air from the water helps keep the airways clear. Many athletes use the pool as a training tool while rehabilitating an injury. When you are up to your neck in the water, your body is only giving ten percent of its weight, and yet water provides 12 times the air resistance, making it ideal for strengthening and toning muscles. 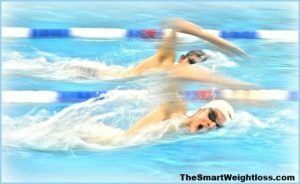 Swimming involves all major muscle groups, abs and back muscles to your arms, legs, hips and glutes. It effectively complements other exercises, such as running and walking, or it may be your only form of the physical condition. Cycling is another sport that requires a high level of effort, and therefore one of the best activities to lose weight (between 372 and 1,110 calories per hour). Physical wear and tear will be determined by your body weight, speed, terrain, and grade. For many, it makes it more bearable than running and does not require as much effort, since pedaling requires less physically than strides. Practicing outdoor cycling is the best since the varied terrain allows for a comprehensive workout that includes strengthening the lower body at the same time as good cardiovascular exercise. Another highly recommended option that is fashionable is the best mountain bike and spinning. For those who do not know, spinning is done with a static bicycle (and usually in a class with more people). The intensity of the training will vary depending on the rhythm of the background music. In a spinning class, you can get to do something more than 30 kilometers. Tennis is a very entertaining sport in which in addition to having fun we spend a high caloric amount. In a tennis match, you can burn up to 600 calories in an hour. When practicing with another person, in that competitive struggle, we hardly realize the effort we are making. So in addition to having fun, we get in shape. If you are thinking that you are not good, do not worry, just run around the balls you are exercising, which is the main objective. The nature of tennis makes it a great workout for the whole body since playing can help improve your flexibility, balance, and posture as well as reduce the stress accumulated during the week. Throughout the game, especially every time you hit the ball, the arm, abdominals and leg muscles are gaining strength and burning calories. Sports like tennis stimulate brain functions to improve memory and the ability to learn new things. In fact, the National Institute of Health includes in its list tennis as one of the activities that promote the health of the bones. Also, you can try some physical sports to loss weight early such as Football, basketball, dart board etc. The Crossfit is a highly most effective weight loss exercise, just like high-intensity training is only suitable for people who have been exercising in a certain regularity for a couple of months. Cross fit is a training regimen that consists of lifting weights, resistance exercises, polymeric exercises, strength and speed training, and Russian weight training routines, among other activities. Unlike other routines in which a single exercise per series is performed, the Crossfit incorporates several. In addition, you can train all the muscles at the same time, or one in particular, but in an intense way, which increases the burning of calories. It is designed to improve all major components of fitness such as endurance, flexibility, speed, power and cardiorespiratory fitness. – Five repetitions of 20 push-ups, 30 push-ups, 40-50 abs, and 20 squats. (With 3 minutes of rest between repetitions). Cross fit routines are not made for sensitive hearts, but are very effective in burning calories and fats, improving endurance, and increasing muscle mass. To get the most benefit from CrossFit, it is wise to change the routine at least three days a week, but ideally five days. Luckily, the routines are short, only last for 15 or 20 minutes when done correctly. Skipping rope is one of the favorite activities for all children in almost any part of the world, but the benefits it brings when it comes to losing weight make it a more than a useful tool in our physical routines. With just jumping for 10 minutes we spend the same caloric level as when we run for 1.5 kilometers. An hour jumping rope burns more than 800 calories and works the arms, legs and back while strengthening bones and joints. It is also an excellent activity to improve coordination, agility, and endurance. Jumping rope is a high-intensity activity, and as such, you do not need to do it for an entire hour to see the benefits. It is necessary to know that to avoid injury, the knees should be slightly flexed while holding the rope at hip height with the palms towards the body. It jumps using the tips of the feet, and without the rigid knees. The upper body should be perpendicular to the floor. For a good session, it takes 13 minutes (You can divide the series as you think). Of which, 1 of them must be at high intensity and another of rest. Start by doing the exercise with your feet together, and then alternate every ten repetitions. To end the session, do a round of resistance. In this, you must jump for 5 minutes in a row in any way you want. Aerobics, which became popular in the 1980s by training guru Gin Miller, is a low-impact exercise but with excellent cardio and calorie burn benefits. In a 45-minute aerobic workout, about 550 calories are burned. In turn, it improves coordination of the muscles of the legs and arms, makes the hips agiler, and also exercises the glutes. An hour of aerobic exercise provides the same fat burning and cardiovascular benefits as an 11-kilometer race. Another great advantage of aerobics is that it can be performed both in a gym and at home. In the gym we would take the lessons of the monitor, at home we would only have to search the Internet. Russian dumbbells, even if they do not ring you right now, you’ve probably seen them on occasion. They are those balls made of iron with a horseshoe-shaped handle. Unlike common dumbbells, with Russian dumbbells, we have to work with the whole body to maintain stability and counterbalance the weight of the ball. 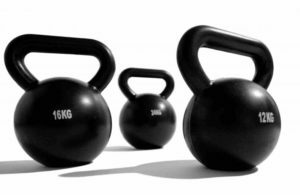 These weights are for the training of considerable intensity. You can burn up to 400 calories in just 20 minutes. Doing exercises with Russian weights will improve balance, and strength in all muscle groups and stabilizers. Because Russian weightlifting exercises involve the whole body, they speed up the metabolism for and burn fat faster. In addition, it will increase the intensity of the blood pumping, so it is also anaerobic training. In fact, 20 minutes of Russian weight training is similar to a 9 kilometer run in terms of cardiovascular benefits and calories burned. As a recommendation for working with Russian dumbbells, learn from someone who is accustomed to working with them, or a gym monitor, to avoid possible injury.